Vacation has always been a different strokes/different folks kind of deal. Some visit family; others stay at home. Some, like my colleague Mike Hoffman, spend a week sipping wine and eating cheese in Napa. One airman, though, heads to South Beach to work for his favorite NBA team. Staff Sgt. Parron Outing, assigned to the Air Force Network Integration Center, has been one of the team’s gophers since he was 12. As an attendant, he sets up the locker rooms and court before practices and games, fills ice bags, handles luggage and a bunch of other odd jobs. Not such a bad gig now that the Heat are the center of the pro basketball universe. 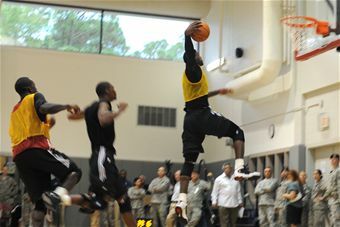 Outing was one of the players behind the scene to arrange the Heat’s preseason camp at Hurlburt Field, Fla., in September.